Wow what a year! I am so very proud of both my daughters accomplishments this year on the softball field. You know I'm pretty darn proud of myself this year as well. Our Spring Season starts with Rachel and I moving up to the Junior League, where girls ages 13-15 play. This year there is only two teams and both have managers. I was asked by both managers to be their assistant, and decide to go with the team that has no catcher, which guarantees Rachel a lot of playing time. The manager is a friend who I have coached with before 5 years ago. Rachel catches every inning of all 11 regular season games and we went 10-1. The game we lose incidentally, we had the winning run at second, when Rachel had a line drive snared by the shortstop for the final out. Now the tournament starts, where the best 12 players from each town play each other in a double elimination tournament. This is more widely known as the Little League World Series. Rachel is chosen for the team and I am asked to help coach and keep the official scorebook. We run the table winning every game! Rachel and another catcher take turns with the catching duties, and spend time in the outfield when they are not catching. This causes the only hiccup in the tournament, when the other catcher is playing left field and Rachel is catching. With the bases loaded, a fly ball is hit to left. The girl catches and drops the ball. She recovers quickly and fires a strike to home as the runner at second was attempting to score as well. Rachel blocks the plate, snags the throw, and is knocked backwards by the sliding runner. The umpire yells "Show me the ball catcher", and Rachel thrust her hand in the air with the ball in it, "She's out", yells the umpire. Needless to say the right fielder is still upset when she returns to the dugout and screams at me that it is my fault, because she is a catcher and has no experience in the outfield. I reply, "That's enough", and we go on to win the game. A few days later at our next practice, I pulled the girl aside and explained the "Team" concept again and remind her that Rachel is playing the outfield with no experience as well. I tell her even with no experience she is the best athlete we have for defense in the outfield. I also tell her disrespect for the coaches will not be tolerated. She apologizes profusely, and we agreed to be friends again with a handshake and a hug. In my experiences raising two daughters I know that emotions can get the best of girls and I wanted to be sure to put this episode behind us. The rest of the team witnessed the outburst and saw me pull the girl aside at the practice, so everyone is happy with the outcome. 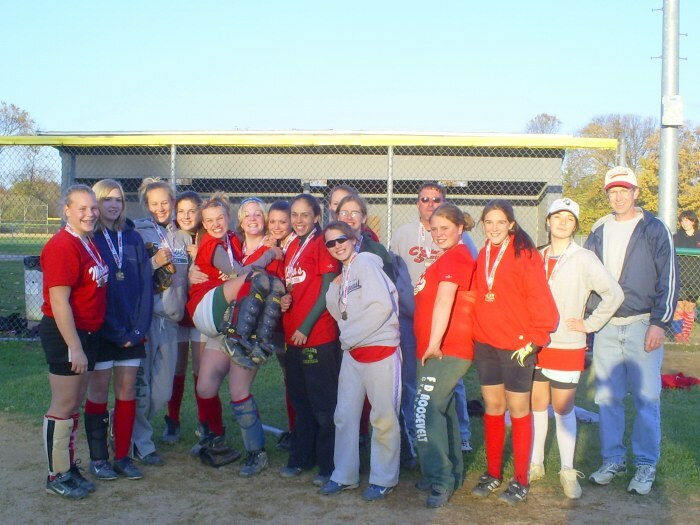 I will always remember this game, as while we were playing in the tournament, Emily was touring Europe on a class trip. She called me at the start of the game, while I was on the field being introduced, and she waited patiently while we sang the star spangled banner. She spoke with me briefly and informed me she was in Italy, preparing to watch the World Cup final on TV. Italy was one of the teams in the final game! We were text messaged during out game that Italy had won, and I thought of the irony that we were celebrating our win and across the ocean Emily was seeing a celebration in Italy of the World Cup win. In the final game, we played Beekman at Beekman. It was one of the hottest days of the year with a LOT of humidity. We were the favorites, as we had defeated this team once in the tournament. They played us on a Senior League field to try to upset us. The infield was so large the outfielders were standing in the dirt of the infield. It was Rachel's turn to catch and she did a great job in the heat. Rach also started a rally with my help. She struck out swinging on a ball that bounced in the dirt before the catcher caught it. This league plays "dropped third strike", meaning if the catcher does not catch the third strike cleanly, the batter may run to first. Usually this play occurs when the ball gets by the catcher, however it still applies if the ball bounces into the catcher's glove. I screamed for Rachel to run, which she did, and the catcher was caught puzzled and threw to first late. It would have been the third out of the inning, however we went on to score 2 runs that inning after the play. After the win, the league president gave us a banner that said District 17 Junior League Softball Champions, and called our names one by one as he handed us pins for winning first place. 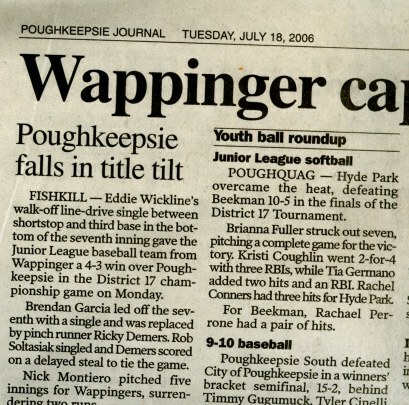 We went on to play Haverstraw in the sectional game in Rockland County. They had a beautiful field, and we played a great game. Our star pitcher got a case of the nerves and walked in 4 runs. We hit the ball well, but went on to lose 6-4. Rachel and I have had a goal of winning the District title one year, and this year we did it! Next Spring we will be announced as Champions at the opening day ceremony and they will announce our names one by one to our home crowd. We will be awarded District 17 champion jackets, and most important, a metal sign will adorn our snack bar, listing all our names for the next 20 years of players to see. The newspaper ran this article about us. 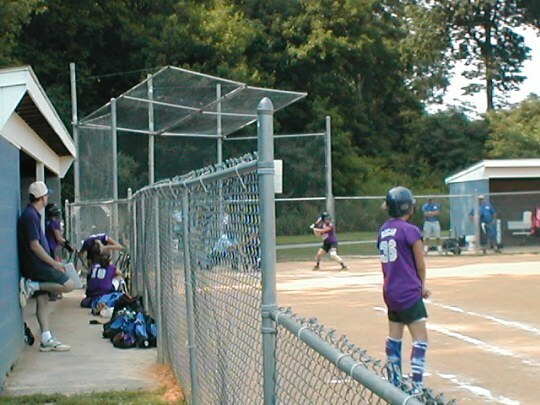 Here is Rachel batting as I look on keeping score. This would be enough for any Dad, but the good times continued. 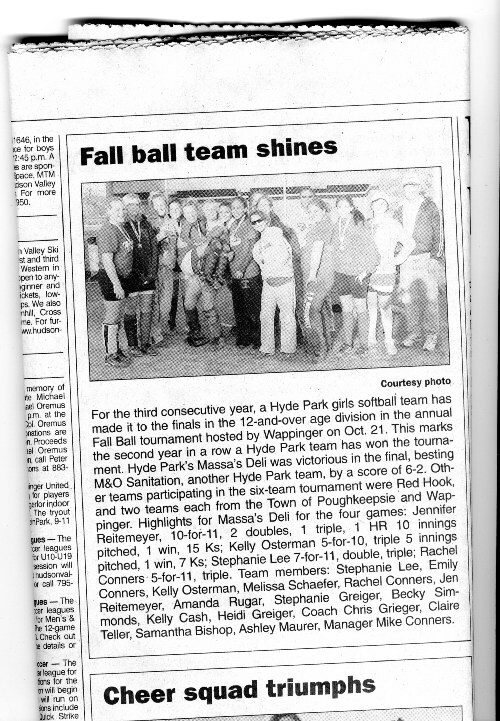 I managed one of the Hyde Park Fallball teams and enjoyed another 7-1 season. In the Fall, Emily plays on the team too, since crew is over with. Rachel caught every game, Emily spent time at first, and the outfield. The Fall season ends with a one day tournament. Once again We Won! We played 4 games and won all four. Rachel hit a triple in one of the games and went 5 for 11 in the tournament. Emily missed the first 2 games while she took the PSAT test, then raced to the field and played first base in the championship game. One stellar play in the finals saw Rachel making a great catch on a pop up behind the plate. There was a runner at first who slowly retreated after the catch, Rachel fired the ball to first, where Emily was wisely covering, the runner is out, double play! I am very blessed to have two very athletic daughters, who dazzle me year after year with their accomplishments.